UnitedHealth Group Incorporated operates as a diversified health care company in the United States. It operates through four segments: UnitedHealthcare, OptumHealth, OptumInsight, and OptumRx. The UnitedHealthcare segment offers consumer-oriented health benefit plans and services for national employers, public sector employers, mid-sized employers, small businesses, and individuals; health and well-being services to individuals age 50 and older, addressing their needs for preventive and acute health care services, as well as services dealing with chronic disease and other specialized issues for older individuals; and Medicaid plans, Children's Health Insurance Program, and health care programs; and health and dental benefits. The OptumHealth segment provides access to networks of care provider specialists, health management services, care delivery, consumer engagement, and financial services. This segment serves individuals through programs offered by employers, payers, government entities, and directly with the care delivery systems. The OptumInsight segment offers software and information products, advisory consulting arrangements, and services outsourcing contracts to hospital systems, physicians, health plans, governments, life sciences companies, and other organizations. The OptumRx segment provides pharmacy care services and programs, including retail network contracting, home delivery, specialty and compounding pharmacy, and purchasing and clinical, as well as develops programs in areas, such as step therapy, formulary management, drug adherence, and disease/drug therapy management. UnitedHealth Group Incorporated was founded in 1974 and is based in Minnetonka, Minnesota. Company description from FinViz.com. UnitedHealth, Anthem, etc were all crushed last week when Bernie Sanders resurrected his Medicare for All proposal. In theory this would end corporate and private health insurance and significantly reduce government reimbursements. Traders ran to the exits. UNH fell $30, ANTM fell $40. This is completely unrealistic. First, Sanders has little or no chance of being elected. Second, even if he was elected the House and Senate would have to have strong democratic socialist majorities, not just a democrat majority. There are plenty of democrats that can do basic math and this proposal in its pure form would cost about $3.3 trillion and do irreparable harm to the healthcare sector as it currently functions. Three, assuming the first two items came to pass it would be at least 2022 before any changes could occur or nearly four years from now. That means the panic from last week was completely unreasonable. The decline was also blamed on potential changes to Obamacare now that a court has ruled it to be unconstitutional. President Trump has said he did not want to deal with it until after the election and that puts any changes to that program at least two years into the future and would require a republican majority in the House. 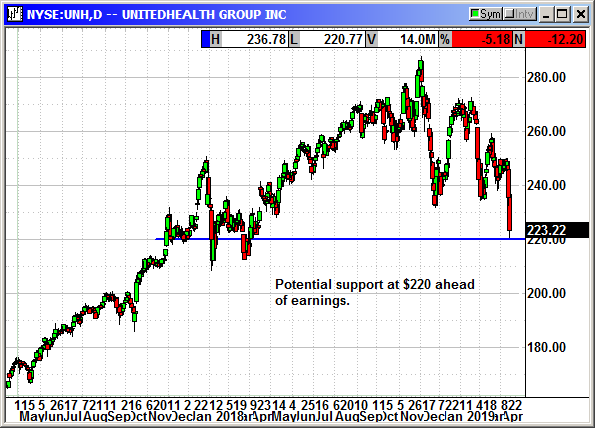 Clearly, there is no immediate danger to UnitedHealth and this is a buying opportunity. There is one danger. Earnings are Tuesday. While I seriously doubt they are going to post a big miss, even if they did would it mean a further decline after a $30 drop over the last two days? What if they beat? That could cause some significant short covering. Buy Jan $250 Call, currently $9.75, no initial stop loss because of volatility. Sell short Jan $290 Call, currently $2.10, no initial stop loss.